Do you understand what this picture is? Even more impressive do you know the answer*? If so wow, thanks for even knowing me and hopefully your genius will rub off, and for everyone like me what you are looking at is… a job ad. Yup. 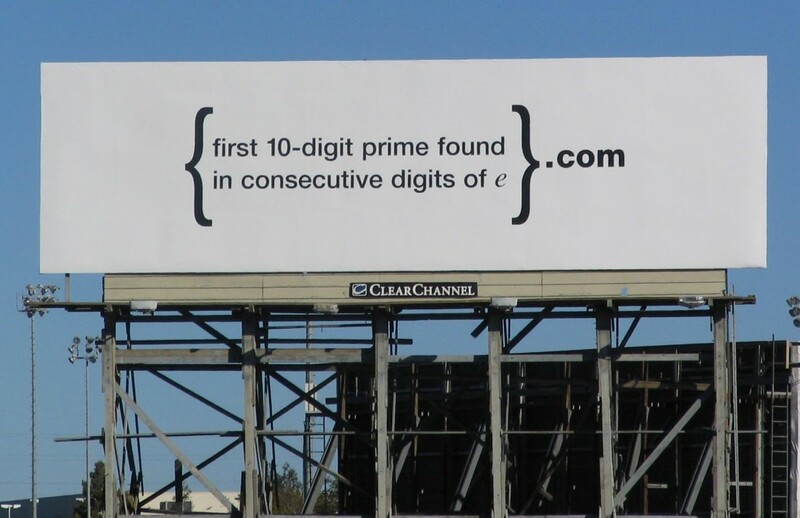 This is a big outdoor poster which Google put on the highway in the area near their offices in Palo Alto, California. What you have is a complex mathematical calculation, the kind that only the elite level of mathematicians and/or computer science graduates would be able to figure out. The brilliance of the ad is on several levels. It is very engaging, we all love a puzzle and want to understand something that at first glance makes no sense, in a space where we are used to simple, clear ads. Yet note there is no mention of Google. Next the placement was in a high-volume, and notoriously low-speed traffic area. A very captive audience in an area not only geographically close to the office (always nice to have staff who do not need to commute a long way) but more importantly who work in the Silicon Valley where you have the high concentration of exactly the kind of people who can solve such complex maths. Once you calculated the answer and visited the website you were presented with another, even harder (! ), math/coding puzzle to solve (but again no mention of Google). Crack this and finally you get to a Google-branded recruitment website where they congratulate you and are very keen to talk to you further. Of course in this day of search and social media such an advert can only last so long before the answers are published. I imagine Google only talked to the first few people to come to them via the campaign. Try calculating the internal staff motivation and external PR gold that is worth. * The answer is 7427466391.com.